Have you ever committed to something and half way through wondered why in the hell did I think that was a good idea?!? That is where I am right now. Day two of a three day juice cleanse. It’s my first and I’m finding it challenging to say the least. I bought into the idea when people told me, “you won’t be hungry” and “it will reset your system and stop your cravings”. Well - so far the cravings have subsided, but the hunger hasn’t. I miss food. I really, really miss food. Admittedly, I do like a good challenge. I figure if this person or that person can do it, why can’t I? Yet, taking on challenges with my health is relatively new. I have always been overweight to some extent. I enjoyed eating bad-for-me food and never did more physical activity than necessary. If the zombie apocalypse happened I would’ve been one of the first to go. Chew away zombies because I’m not doing cardio to escape! Then, about a year ago I signed up for my first half marathon even though I didn’t think I could finish it. Since I had no idea what I was doing, I hired a personal trainer and got on a meal plan. Everyone, including my trainer, thought it was a lot to take on all at once, but if I’m going to do something, I’m going all in. Thirteen-point-one freaking miles is a long way. Actually running them is a physical test yes...but also a much greater mental test. You learn a lot about yourself in the journey of preparation and completion. I finished it a different person than I was when I started training. Bring it on zombies! I'm not going down easy now. 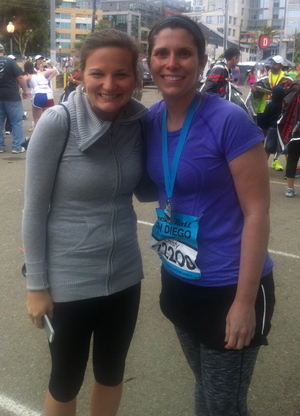 However, my second half-marathon, nearly a year later, was awful. I didn’t train as hard as I did for the first. Thankfully, I finished without seriously hurting myself and despite my less than stellar performance, I still took advantage of a little tradition I’ve started. After each race, I let myself eat whatever I want. It's like a little reward for all of the work I put in. A milkshake and a burger aren’t the end of the world after such an outpouring of physical energy. The problem with my tradition, is that I've been an emotional eater since I can remember. My best friend/worst enemy has always been the carbohydrate. I wasn’t feeling emotionally great before the run so when I gave myself permission to let go...I really let go. For a few weeks I enjoyed every sweet treat, burger and cocktail within my reach. I didn’t fall off the wagon, I jumped! Guess what happened? I gained weight. More than I've gained in over a year. This isn't my first time off the wagon, but it's the worst. My shame cycle was in full effect. I feel fat and worthless with no self control, so I eat even more. A relief sweeps over me during the meal then shame comes ten times more than before. Next thing I know my pants are tight. If it weren’t for my wardrobe, I’m sure I could comfortably live in this cycle for the rest of my life. But my jeans are there to let me know...it’s getting out of control. The hardest part of getting back on the wagon, is dealing with your own shame. Too many times we let shame and embarrassment control our future. So I ate what I wanted to with no regard and gained weight...It happens. It certainly isn’t the end of the world. It doesn’t make me an out of control person. It doesn’t make me less than anyone else. It doesn’t mean I can’t do my job. It doesn’t mean I won’t ever have a date again. It doesn’t mean I’ll never get back into those new pants. These are all of the little thoughts that could control my future. But they won’t. For me it is about recognizing the cycle then forgiving myself, letting it go and moving forward. Once I recognize that I control my thoughts and they don’t control me, then I have the power. Choice comes from this power. I could choose to sit in self pity and shame, or I can choose to move on. My juice cleanse. You can order it online and so far it works. I've lost weight and already feel back on track. This time, I chose to move on to a juice cleanse. It’s my step ladder back up the wagon. And signing up for my third half-marathon will motivate me to put a plan in place … and stay on it. Backsliding happens from time to time. BUT - recommitting to what is important in your life and moving forward also happens.